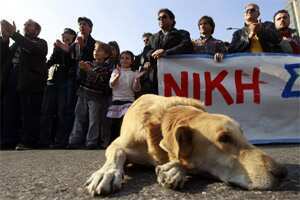 Metal industry workers hold a banner as they protest during a rally in Athens on 21 November , 2011. Reuters. Athens: Greek private sector workers will stage on 1 December the first major strike since a national unity government took over, signalling that labour unions will not soften their stance against austerity policies under the new coalition. GSEE, the country’s umbrella trade union representing about 2.5 million private sector workers, called the 24 hour strike on Tuesday to protest against the 2012 budget, which is scheduled to be approved by parliament on 7 December. Passing the 2012 austerity budget is one of the conditions for receiving a €130 billion bailout from the country’s international lenders. Public sector trade union ADEDY, which represents about 500,000 state employees, will decide later on Tuesday if it will join the walkout. The 2012 budget includes a series of tax increases and spending cuts to ensure the budget deficit falls to at least 6.7% of GDP next year from 9% in 2011. Both Greece’s major parties, socialist PASOK and conservative New Democracy, said they will back the budget. The coalition government led by former European Central Bank vice president Lucas Papademos, which took over earlier in November, submitted the budget last week.